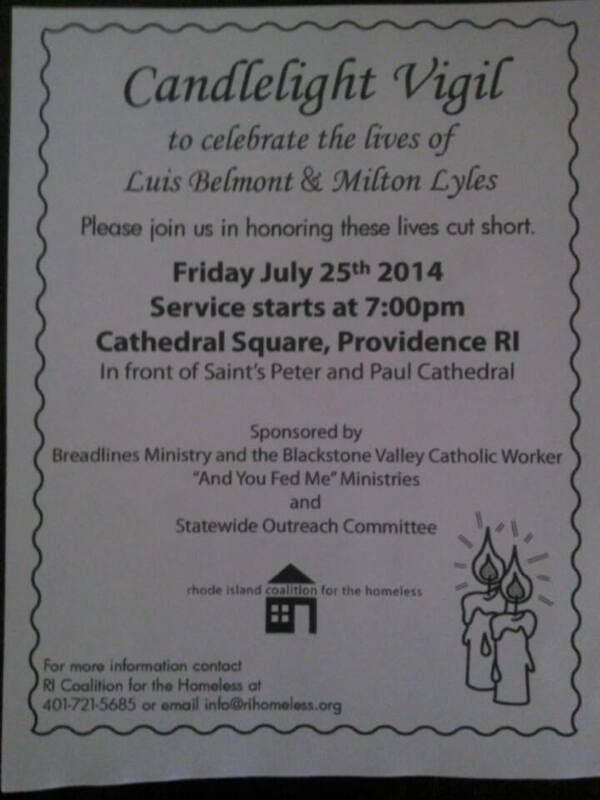 Friday nights are always fun nights on the Food Truck, but this one will have a bit of a somber tone…you see, this coming Friday night there will be a candlelight vigil in honor of two homeless men who recently passed away – Luis Belmont and Milton Lyles. We usually crank up some old-school music, dance while we pass out food, and make sure we hand out more smiles than hot dogs on Friday nights, but we’ll have candles instead on Friday. After we finish our normal Food Truck run to the Overflow Shelter at the ACI and our Salvation Army hot-spot on Broad Street, we will mosey on down to the vigil to show our support – a stark reminder of how precious life is and how tough living on the streets can be. The vigil will be held Friday night around 7pm (until shortly after sunset) at Cathedral Square in Providence, right out in front of Saints Peter and Paul Cathedral. It is being sponsored by a couple of groups that we bump into from time-to-time when we are out feeding the homeless, Breadlines Ministries, the Blackstone Valley Catholic Workers, and the “And You Found Me” Ministries…These groups have been out feeding the homeless for quite a long time now, and it is such a blessing whenever we run into them on the streets as we get to encourage each other while we spread the Love to the city. None of us is in this alone. The other group sponsoring the event is the Statewide Outreach Committee, who are constantly out there lending a helping hand. I spoke to Wendy Thomas, of the Coalition about the vigil, and she hopes that it raises awareness for the need for affordable housing for the homeless and low-income. In an ideal world, she states, the housing would also be on a bus line so people would be able to find transport for jobs that would support themselves and their families. A similar vigil was held in May for homeless Warwick man who passed away. If you can make it, please join us as we come together in strength and unity…if we can just reach one more person, and help get them out of a life of destruction, all the time and hard work is well worth it. Throughout the years, I’ve learned that you can never give up on anyone, because their breakthrough might literally be right around the corner! Let me know if you are planning on going, and if you do go please visit this blog again and post your own thoughts through the comments section!! !